The Wide Field Imager on the MPG/ESO 2.2-meter telescope at the La Silla Observatory has imaged a region of star formation called NGC 3324. The intense radiation from several of NGC 3324's massive, blue-white stars has carved out a cavity in the surrounding gas and dust. The wispy clouds of a distant nebula bursting with newborn stars take on an eerie face-like shape sculpted by stellar winds in a new photo snapped by a telescope in Chile. The hotbed of star birth, called NGC 3324, is full of hot young stars, whose ultraviolet radiation is making the gas clouds glow. 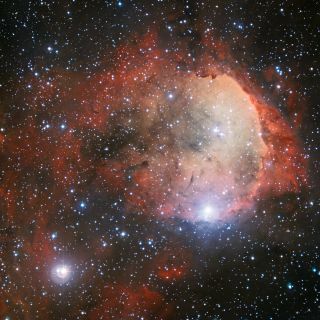 The stellar wind and radiation from the newborn stars has also punched out a cavity in the surrounding gas and dust. The edge of the wall of gas and dust at the right in the photo resembles the profile of a human face, with a ridge in the center that looks like a nose. Astronomers often attach nicknames to nebulas based on their shape and their earthly likenesses. NGC 3324 is sometimes called the Gabriela Mistral nebula, after the Nobel Prize-winning poet from Chile, ESO officials said. NGC 3324 is located approximately 7,500 light-years away from Earth in the southern constellation of Carina (The Keel, which is part of Jason's ship the Argo). The nebula lies on the outskirts of a region of the Carina Nebula that has been shaped by many other bouts of star formation, ESO officials said in a statement. Several millions of years ago, NGC 3324 experienced a flurry of star birth that created some of massive, hot stars that can easily be picked out in the new picture. Strong stellar winds and intense ultraviolet radiation from these young stars have carved out a pocket in the nearby gas and dust. This can be seen in the wall of material to the center right of this image. This radiation also creates the stunning colors in the image. The pink and red hues come from the reshuffling of electrons from hydrogen atoms, as they are first knocked out and then recaptured. Other colors come from the presence of other elements, with double-ionized oxygen in the central parts creating the signature greenish-yellow color. The dark patches in the image are regions where veils of dust block out the light from the background glowing gas. The Hubble Space Telescope has also previously studied NGC 3324, but while its instruments can detect finer details than this panoramic view, the space observatory has a much smaller field of view, ESO officials said. As such, these two complimentary views provide astronomers with a "zoomed in" and "zoomed out" view of the bustling stellar nursery.